Laura Moncion is a Canadian graduate student currently working on medieval spirituality, historiography, and queer theory. Other interests include poetry, fermentation, and quoting Judith Butler at parties. Sometimes, being a dangerous woman means doing what men do freely but being punished for it as a woman. In the fourteenth century, Marguerite Porete learnt this the hard way, by writing a mystical text that pushed the boundaries of the human, challenged ecclesiastical authorities, and would eventually cost her her life. Not much is known about Marguerite’s early life, except that she was born in what is now Belgium, around 1248 or 1250. She is best remembered as the author of the Mirror of Simple Souls (Mirouer des simples ames anienties), which was written around 1300. The Mirror is a mystical text structured as a dialogue between the personified figures of Love and Reason. Reason asks Love a series of questions about the soul’s journey to unite with God. Reason’s nitpicking inquiries and Love’s simple, swooping answers allow Marguerite to both answer questions which the reader might have and establish the authority of Love over Reason. This type of dialogue is a fairly common trope in didactic medieval religious texts; where the Mirror becomes mystical is in Love’s answers. Through the person of Love, Marguerite explores the idea of total annihilation of the self in mystical union. At the peak of the mystical experience, according to the Mirror, the mystic can cease to exist and become instead a piece of God. This is the key to the spiritual anarchy which laces all mystical texts: the idea that a person can experience the divine while still alive. This is the claim that calls into question the limits of what humans can know and what they can be. Marguerite’s text claims that humans can in fact become God by unbecoming themselves. By stripping away human anxieties, ambitions, and that bugbear of medieval theology, the human will, a person can cease to be a person and actually become the divine – for a few moments only, before being plopped back into their earthly body. The Mirror describes the human becoming lost in God as a river flowing into and getting lost in the sea. This claim to having not only known but been a part of the divine gives Marguerite the spiritual authority to write her text. It also gives her the spiritual authority to reject other sources of authority – namely, the Church. She refers to the medieval Church as ‘Holy Church the Little’, subordinate to ‘Holy Church the Great’ which is made up of those mystics who have had contact with God’s divine eternity. While Holy Church the Great is the domain of Love, Holy Church the Little is ruled over by Reason – that same Reason who ‘leaps to conclusions and neglects the sweet kernel of meaning.’ By extension, Marguerite’s personal, affective experience of God has greater authority than Church doctrine. This all sounds very dangerous – and it is – but Marguerite was not the only one advocating radical annihilation of the self in the 1300s, nor was she the only one questioning Church doctrine. Meister Eckhart, a male German theologian writing at the same time as Marguerite, preached almost exactly the same ideas to his followers. In fact, there is reason to believe that Eckhart was influenced by Marguerite’s Mirror, or vice versa. Eckhart’s Sermon 52 advises those who desire the spiritual path to make themselves so ‘poor in spirit’ that they cease to exist and become one with God. In the same sermon he challenges the Church’s authority, and the idea that the best way of reaching divine illumination is through reason. Marguerite and Eckhart’s ideas are very similar and similarly dangerous – but they were treated very differently. Although they walked the same spiritual tightrope, and were both under suspicion for most of their lives, it is Marguerite who paid for it with her life. 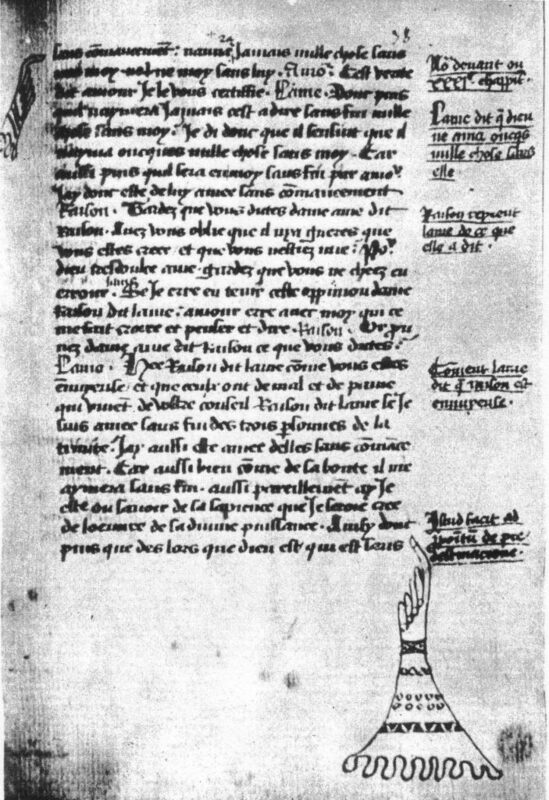 Sometime between 1296 and 1306, the bishop of Cambrai declared the Mirror heretical and had copies of it burned in the public square of Valenciennes. Marguerite caught wind of this and objected. She sent the Mirror to three other theological authorities for approval. Even though they all agreed that the Mirror was technically orthodox, Marguerite and her book were brought before the papal general inquisitor of France, the king’s confessor, William of Paris. She was eventually found guilty of being a ‘relapsed heretic’, and burned on 1 June 1310 in the Place de Grève in Paris. There are a couple of reasons why the inquisition made Marguerite pay with her life for a book which clearly could have been – and was – considered orthodox. First, the inquisition examined the Mirror in its standard way, by extracting sections from the text and having theologians assess these snippets for theological correctness. When read in this way, bits of the Mirror which seem to mock or denigrate Reason taken out of context can make the whole text seem like a rant against the Church’s authority, or a spiritual programme intending to dismantle Holy Church the Little. Marguerite also lacked the institutional protection that saved Meister Eckhart when he was later put on the spot for his writings. Marguerite began her religious life as a Béguine. Halfway between a nun and a layperson, a Béguine would live in a communal dwelling with other women devoted to the religious life, but not take formal vows of poverty or chastity. Many Béguines remained in these houses for the duration of their lives, but some also left to marry. They were often associated with local parishes, and were taught by local priests, but Béguines were not formally regulated or administrated by the Church. These women lived dangerously independent lives, not directly ruled by a male authority. Their way of life as tenuously orthodox as Marguerite’s Mirror. By the time the Mirror came on trial, it seems that Marguerite had gone rogue even from her group of Béguines. She did not have a confessor to advocate for her, which had saved other women mystics who had previously come under scrutiny. At the trial, allegedly she neither defended nor recanted her Mirror, but sat in silence as the twenty-one theologians of the inquisition argued. Buoyed by her conviction in her right to live her life and conduct her religion as she saw fit, Marguerite refused to submit to the Church’s idea of what proper female piety should be. A man like Meister Eckhart could just about get away with this kind of spiritual anarchy; for a woman, the stakes were much higher. Her transgression was so much linked to her gender that the inquisitors called her ‘pseudo-mulier’ – fake woman. Because she did not play by their rules, the inquisition found Marguerite guilty of being a dangerous woman, a heretic to her religion and her gender. Women today who speak up for themselves are still labelled ‘pseudo-mulier’ in a number of ways. In a boardroom, women who speak up are called bossy and mannish. In the media, female politicians are critiqued on their clothing while male politicans are questioned on their policies. As well as having their gender identity called into question, women are consistently underrecognized or even punished for doing the same work as men. In the classroom, male professors consistently receive higher ratings than female professors. In almost every country, women are paid less than men for the same type and the same amount of work. Marguerite, although she lived and died in a world much different from our own, is one of a long line of dangerous women which extends into the present day – women who are not afraid to stare down an inquisition, women who refuse to allow their inner and outer lives to be regulated by patriarchal logic.